NETWORK FINALS: The rerun of the SALVATION pilot lost 0.1 in final numbers. CABLE HIGHLIGHTS: A&E’s LIVE PD retook the Friday cable crown, up 0.02 from last week to 0.57. The two short episodes of Adult Swim’s pre-dawn WILLIAMS STREAM were at 0.34/0.31, compared to last week’s 0.36/0.33. MSNBC’s RACHEL MADDOW SHOW was the #4 show on cable at 0.29/2.5M, ahead of Fox News’s 10AM AMERICA’S NEWSROOM at 0.17/1.4M, and CNN’s ANDERSON COOPER 360 at 0.16/816K. Food Network’s DINERS, DRIVE-INS & DIVES rose 0.04 to 0.28. Early morning provided 2 of the Top 10, with Nickelodeon’s MUTT & STUFF at 0.28, and Disney Channel’s PUPPY DOG PALS down a tick to 0.27, with the preceding hour on Disney featuring MICKEY & THE ROADSTER at 0.25, and LION GUARD down to 0.23 from last week’s 0.26/0.25. 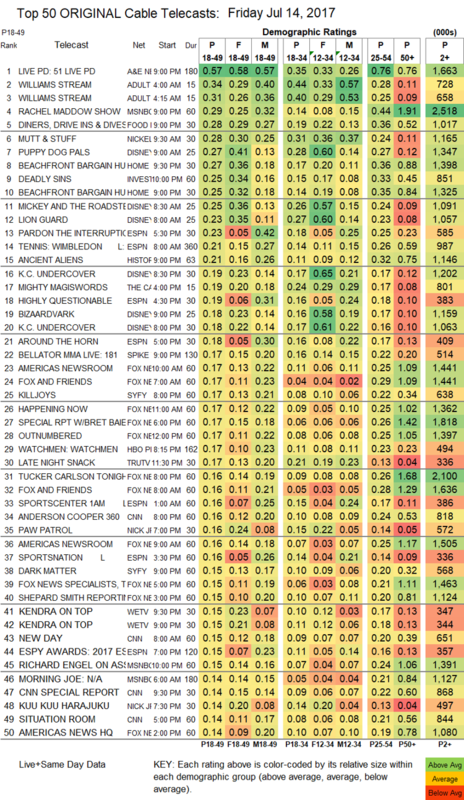 On HGTV, BEACHFRONT BARGAIN HUNTERS was at 0.27/0.25, down from last week’s 0.34/0.32. ID’s DEADLY SINS gained 0.04 to 0.25. ESPN’s morning coverage of the WIMBLEDON MENS SEMI-FINALS was at 0.21. On History, ANCIENT ALIENS fell 0.11 to 0.21. Spike’s BELLATOR was at 0.17. 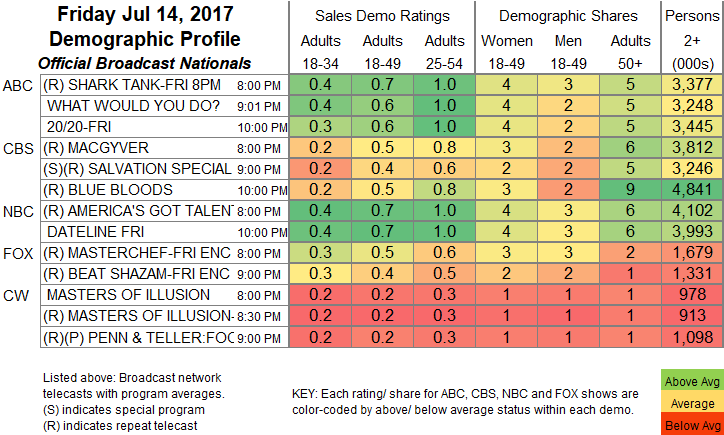 On Syfy, KILLJOYS ticked up to 0.17, DARK MATTER climbed 0.02 to 0.15, and WYNNONA EARP was up 0.01 to 0.13. Both episodes of We’s KENDRA ON TOP were at 0.15, compared to last week’s 0.15/0.12. The season finale episodes of USA’s PLAYING HOUSE were at 0.13/0.09, compared to last week’s 0.16/0.12.